1.Prepare outdoor grill for direct grilling over low heat. With kitchen scissors, snip off wing tips; discard. With sharp knife, split wings at the joint into the middle section and drumette. 2.In large bowl, toss wings, oil, salt and pepper. Place wings on hot grill rack; cover and cook 25 minutes or until internal temperature reaches 165°, turning once. 3.In medium saucepan, heat cola, garlic, brown sugar, tomato paste, hot pepper sauce and paprika to a boil over medium-high heat. Reduce heat to low; cook 10 minutes or until sauce thickens. 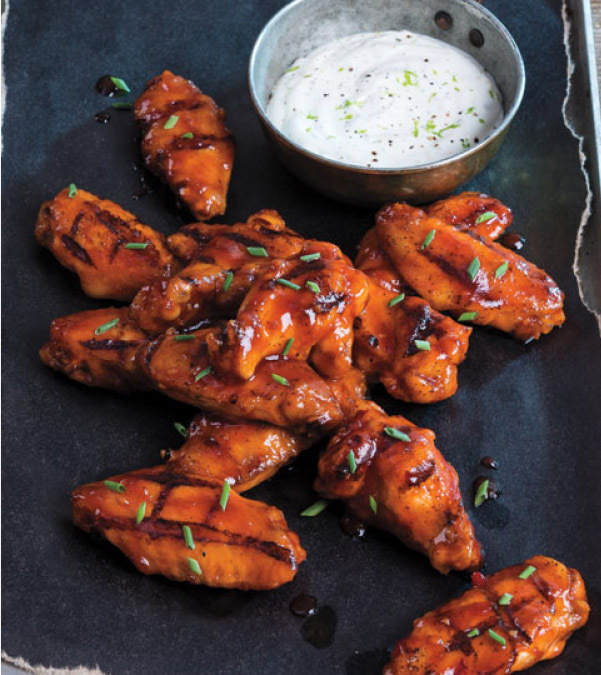 4.In large bowl, toss wings and 1/2 the sauce. Serve with remaining sauce for dipping. > Serve with a mixture of sour cream, mayonnaise, lime zest and juice and minced garlic for dipping.